James Benson takes pictures of his daughter Ali, posing in a crack in the pavement of the northbound lane of Kalifornsky Beach Road on Sunday afternoon. “Yeah, we had to come out here and check it out,” said James Benson, of Soldotna. He and his daughter, Ali, were part of the steady stream of people marveling at the shattered road. 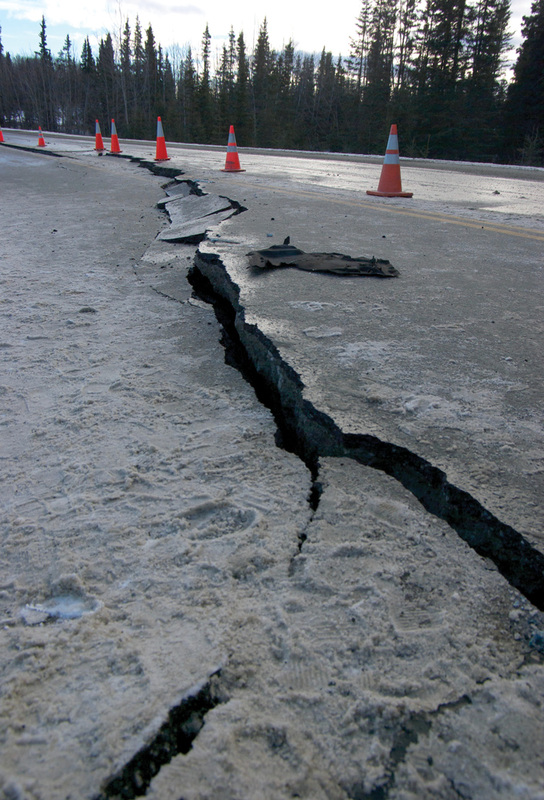 A crack runs about 150 feet through the northbound lane, spidering into fissures that extend laterally down into the snowy marshland off the side of the road. The force of the quake split the road near its center, and the shoulder side of the northbound lane sloughed away and sank up to a foot and a half. The fissures measure as little as inches across to more than a foot wide, with depths up to about 10 feet. 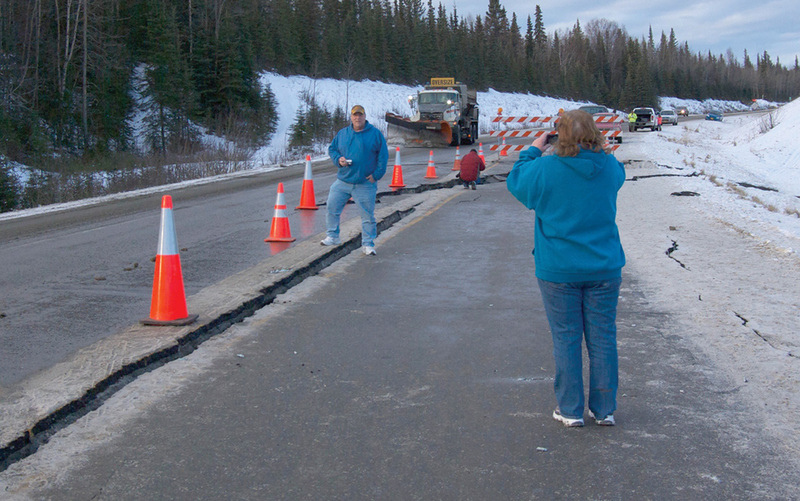 The Alaska Department of Transportation and Public Facilities closed the northbound lane and marked the area with caution signs and cones Sunday morning. Spokesperson Shannon McCarthy said DOT planned to send a work crew Monday morning. “We’re going to have our maintenance crews get in there and make a temporary fix tomorrow so we can open it to two-lane traffic. What they’ll do is they’ll grind up the broken-up pavement and they’ll bring in D1, which is a type of gravel, and smooth it out so that both lanes are usable,” McCarthy said. Workers will repave the road after the weather warms up this summer. During the temporary repairs, one lane of traffic will remain open as much as possible. On Sunday, drivers were getting through the one-lane section without the help of flaggers, though most stopped on the shoulder of the road anyway to take a closer look. Cameraphones were at the ready to snap pictures of the cracks, and a drone camera buzzed overhead. Small talk was all on the same subject — the earthquake. Deb Hartley takes a photo of her husband, Rick, at Mile 1 K-Beach Road on Sunday afternoon. Deb Hartley, of Soldotna, had just finished walking the family dog when her husband, Rick, shouted to her as the shaking started. “I just walked in the house and all of a sudden he goes, grab the TV because it hit not 30 seconds after. I’ve got the dog in one hand and I’m holding the TV. But we didn’t lose anything. There was no damage to the house, so it was great,” she said. 10-year-old Ali Benson was posing for pictures for her dad to send to her grandmother. “This is what Alaskans do for fun,” James Benson said. Ali was marking the occasion by taking home a few keepsakes, clutching a grimy chunk of asphalt under each arm, one with bits of yellow centerline paint still showing. “It’s the road,” Ali said. “Souvenir from her first earthquake she remembers,” Benson said. Ali slept through half the earthquake until her dad woke her up. “I grabbed her and we just headed for the front door, kind of half in, half out of the house,” he said. James remembers being in Fairbanks when a magnitude 7.9 quake jolted Interior Alaska in November 2002. “It was almost fun, but this one last night was violent. Our house was moving 3 feet. We were bouncing going down the hall,” he said. McCarthy said the damage to K-Beach Road is similar to the cracking that occurred on the Richardson and Glenn highways in the 2002 quake. “Our roads, because they’re made to be stiff, when an earthquake comes along they’re like any other structure, they can be susceptible to movement. It can happen on literally any road, if you have a big enough quake with enough movement, it can occur almost anywhere,” she said. ADOT crews were busy throughout the night checking bridges on the Kenai Peninsula, in Anchorage and the Matanuska-Susitna area, and again Sunday during the light of day. McCarthy said that all bridges passed inspection.